Have questions about what to do if you have been injured in a car or truck wreck in Tennessee or one of the neighboring states? Don’t know how to proceed if a medical error or birth injury has harmed or killed a loved one in Memphis or another Tennessee location? The experienced trial attorneys at the Holton Law Firm have the answers you need. If you do not see your question answered here, contact our office to learn more about your individual case. Do I need to be concerned about suffering a uterine rupture? While a pregnancy following a previous C-section is not generally considered to be a high-risk pregnancy, there are some risks to the health of the mother and the baby, most significantly, the risk of uterine rupture. A uterine rupture is a life-threatening medical emergency and expectant mothers should be aware of the risk during pregnancy and delivery. A uterine rupture is a tear along the wall of the uterus, usually along a previous C-section incision or at the site of other uterine surgery. In a complete rupture, the tear goes through all the layers of the uterine wall, resulting in extreme danger to the mother and baby. 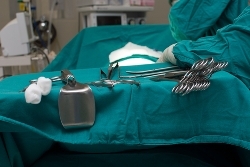 Uterine ruptures are fairly rare occurrences, especially for women who have not had previous uterine surgery, but are still a concern for women who have had a C-section in the past and are attempting a vaginal birth after cesarean (VBAC). What Are the Signs of Uterine Rupture? Doctors and nurses attending to women attempting a VBAC should be watching for these symptoms of a uterine rupture and a C-section should be performed immediately if a uterine rupture is suspected. Women who have had one previous C-section with a low-transverse uterine incision are considered good candidates for VBACs as the risk of uterine rupture is believed to be less than one percent. However, women who have had multiple previous C-sections, or who had a vertical uterine incision, have a much higher chance of a uterine rupture during a VBAC. If your doctor did not advise you of the risks or did not react quickly enough during your labor and you suffer a uterine rupture, you may have a case for medical malpractice. The experienced medical malpractice and birth injury attorneys at Holton Law understand that you have already been through a tough time. We know that the decision to pursue a medical malpractice claim is not an easy one. We will be with you every step of the way to make sure are comfortable with the process and that you and your baby get the settlement you deserve. My family lawyer talked to me about a potential medical malpractice, and he told me I didn’t have a case. Is it possible that he missed something? We frequently hear this scenario, especially with complex medical malpractice cases. Many times, a lawyer who doesn’t frequently work medical malpractice cases may miss important details that can make a huge difference. Those same lawyers may have never called a doctor for an expert opinion, and may not know of a reliable expert to review the case. There is a reason that Tim Holton of the Holton Law Firm has been certified as a Medical Malpractice Specialist: he has years of experience in this field. We will give you a free consultation, and put our decades of experience to work, and in the end, we will give you a candid opinion about whether or not medical malpractice has occurred. A health care provider told me that a previous surgery or treatment from another doctor or nurse caused my injury. How do I find out what the doctor did wrong? When investigating a potential Medical Malpractice claim, it is essential to obtain a full copy of all medical records about the treatment in question. The medical records will contain all labwork, testing, imaging, diagnoses, and notes by health care providers about the treatment, and will allow an expert in the field to review the treatment for any possible errors. The Holton Law Firm routinely requests and reviews medical records to determine if there was negligence or improper treatment. Having worked in the field of Medical Malpractice for decades, the Holton Law Firm has many trusted experts who can provide us with opinions about what went wrong in a given scenario.